Real-life paranormal activity in Australian homes. A captivating exploration of haunted houses. A book to read with ALL the lights on! WHERE SPIRITS DWELL unearths the creaking, spine-chilling moments when ghosts appear in suburbia. Alongside infamous Australian haunted homes, like Junee’s Monte Cristo Homestead and Annandale’s haunted Abbey, WHERE SPIRITS DWELL also takes readers inside other haunted dwellings including schools, pubs and even shopping centres. As she did in her bestselling book SPIRIT SISTERS, described as ‘addictive reading’ by the Daily Telegraph and ‘fascinating and thought-provoking’ by the Sun Herald, Machado spins such a web of wonder that often the interviewees’ lives prove just as fascinating as the spooky experiences they’re sharing with her. Along with these real-life experiences, Machado also investigates the haunted house in history, literature and popular culture in this creepy, intriguing book. After finishing Spirit Sisters, I was struck by the number of experiences that had to do with interviewees’ recollections of homes they’d lived in, and how memories of these dwellings, and of the events that took place within them, shaped the people they’d become. So many of us have a memory—whether it’s wrapped in the shell of a dream, or an imagining—of something uncanny having happened in a house we grew up in. These memories, these seeds of stories, are planted in our minds, where they bloom … take flight … and grow into something special. 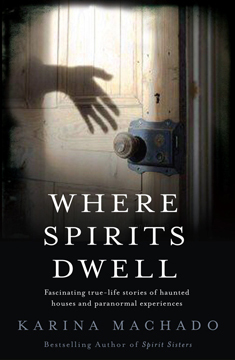 Where Spirits Dwell explores these wonderful stories. Set in houses, apartments, and hotels, from historic dwellings to everyday homes, these stories encompass the chilling reality of haunted houses.